Tunnelr VPN performed quite poorly and the difficulty of the setup is very unappealing. Even though it offers some interesting features, the infrastructure and customer support need improvement. 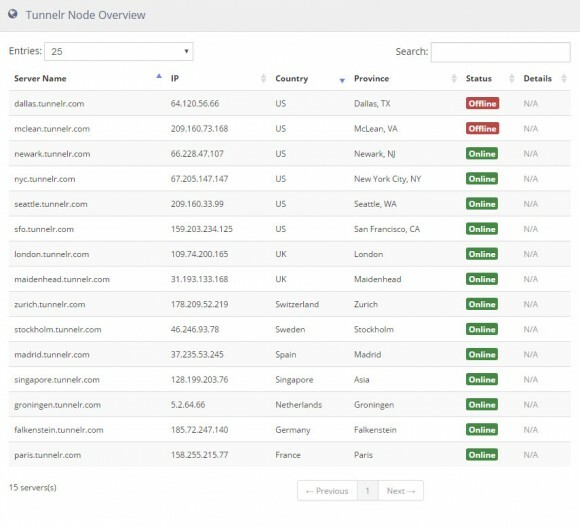 Tunnelr VPN is a US based service that has been on the market for a few years. It was rather interesting to see that they do not mention their operation base location anywhere, and the only information we found about that was in their certificates and domain whois. As a general rule, regardless of the time of the day, during our review we found that there are at least two servers down at any given time. This may have been just an unfortunate coincidence during the few days that we tested the service, though based on the low quality infrastructure (such as unreliable and slow cloud based servers), we doubt it was juts a mishap. 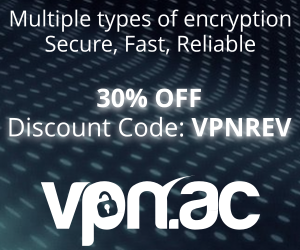 We would also like to mention that Tunnelr VPN offers a trial period of one hour. This time frame will most likely not give you enough time to test out all the features available, but it is worth a try. 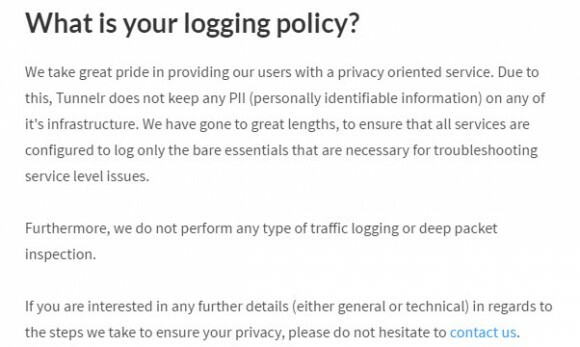 It feels odd that this is all they would have to say in this matter, considering that we are talking about a service that is supposed to be concerned with protecting your privacy. There is no proprietary software available for any of the supported operating systems. The only thing they have is a list with configuration files for each location. And this is where things get stranger still. We were informed that there is no difference between the trial version (one hour trial) and the full service, but when we accessed the location list, every server location had to be downloaded an configured manually. We addressed this question (along with a couple of others regarding the payment methods and location information), but after more than a week, we still haven’t received an answer. There is a blog feature which we assume was intended for news, but there are only a couple of posts there and only somewhat relevant to the topic. 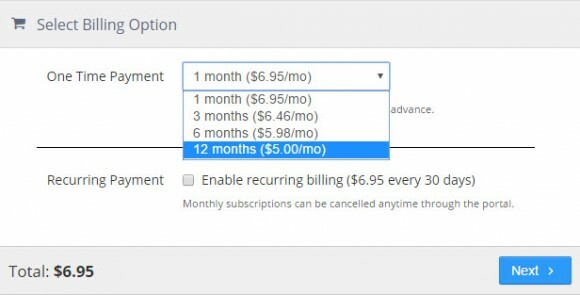 Since there is no stand-alone application, there are quite a few features missing (such as auto-reconnect or kill-switch). This applies to all services that provide only configuration files, because they depend on the open-source solutions which even though are efficient, are also quite poor in the features department. 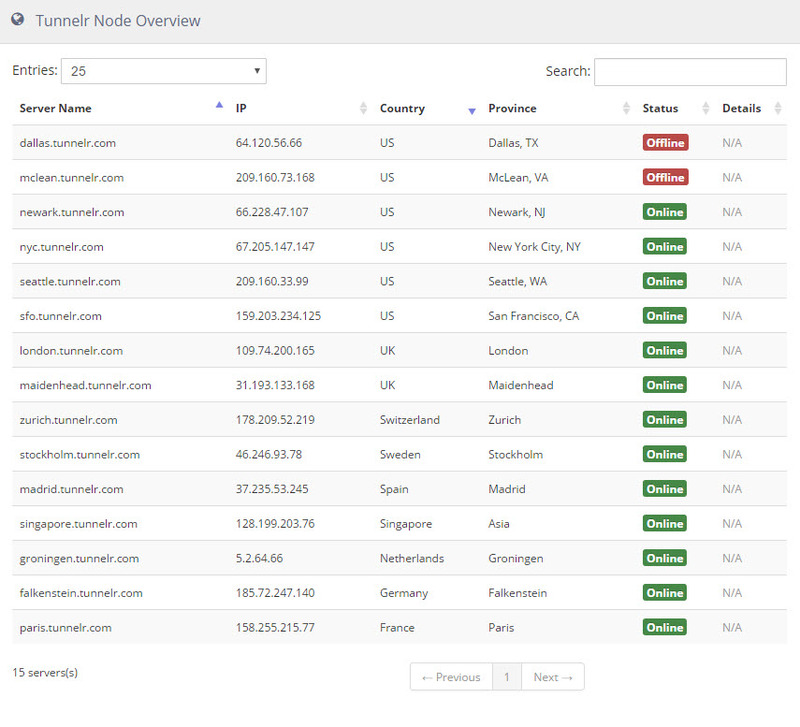 Tunnelr VPN claims to have a “robust assortment of exit locations”, although we failed to see that in real life. They only have 15 servers available. One positive aspect would be that Netflix actually works, as advertised, at the time of this review. Regarding encryption, we would like to mention that Tunnelr VPN uses AES 256 CBC encryption with RSA 2048bit for key exchange. They do support PPTP, OpenVPN, LT2P/IPSEC, SOCKS and OpenSSH, which is not very common as most providers focus on OpenVPN and neglect other protocols. The browsing experience was however fluid, there were no interruptions or disconnects and even media streaming was handled quite well. There were a few spikes, but the speed was not even close to something that would resemble an acceptable level. The latency is a bit higher on the US server, which is to be expected, as is the difference between the speed on the NY and Paris servers. Both servers performed very well and there were no issues, disconnects or interruptions. The browsing experience was fluent and even media streaming websites performed great. 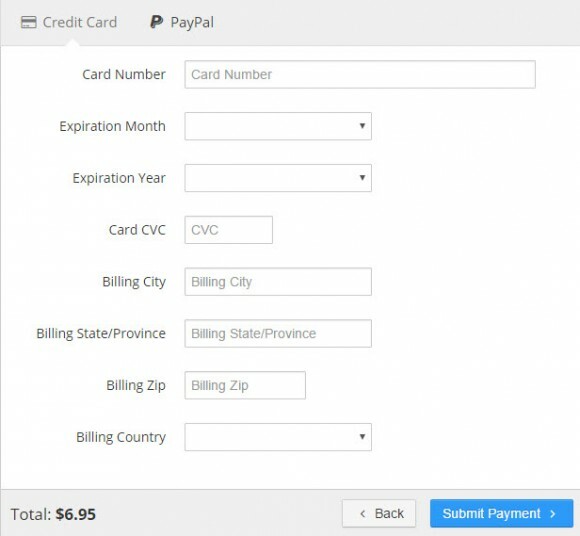 They claim to accept credit cards, PayPal and Bitcoin. There are a lot of contradictions regarding their service, and it seems to be reflecting a lot on the quality as well. The technical support department was nowhere to be found. We made several attempts to contact them with quite a few questions and after four days, none of them were answered. The only way to reach the support team is via a web-form (or e-mail), but there is no live chat or any other way to communicate with them. This pretty much means that if you don’t get an answer in time via e-mail, the only thing you can do is send another e-mail (which in our case did not get answered either). Very user-friendly website, assuming that they are computer-savvy. Supports SOCKS tunneling via SSH. Decent performance especially with SSH SOCKS5. No information available about the company. 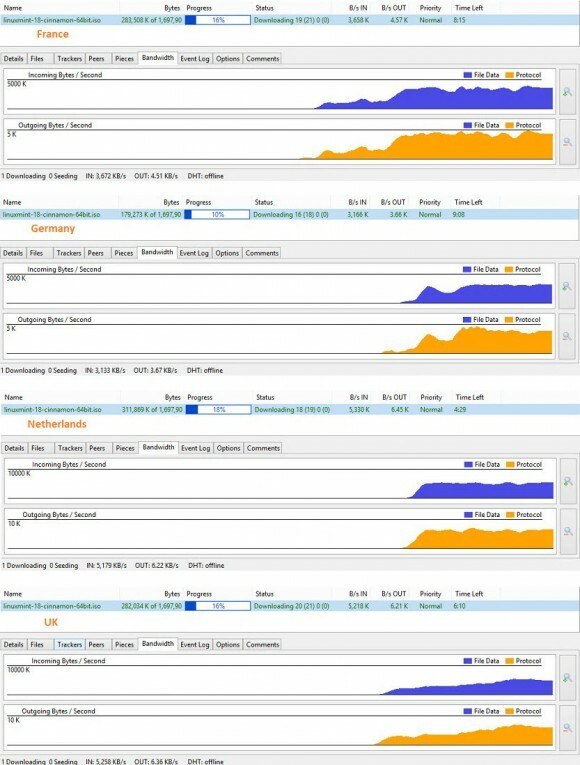 They use cloud/VPS servers (can be slow, unreliable, not secure). No bundle available for config files (setup process is a bit time-consuming). Speed test results were somewhat average in P2P testing. Practically no customer support (we never received an answer). With this in mind, we give Tunnelr VPN a 5.5/10 because of the missing features and difficulty of setup. The speed test results were also not the best and we would like to see a greater number of servers available, preferably dedicated hardware instead of cloud/VPS servers.